TB is one of the world’s deadliest infectious diseases with an estimated 9 million individuals diagnosed and 1.6 million deaths every year. This makes TB the second leading cause of death by an infectious agent, behind only HIV. In 1993, the World Health Organization declared TB a global emergency. This realization has resulted in a significant push to develop new treatment and prevention strategies. 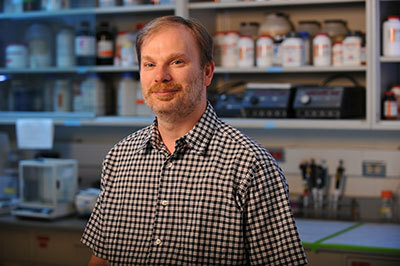 The Schorey laboratory at Notre Dame will work in conjunction with Karen Dobos at Colorado State University and collaborators at the University of California at San Francisco to identify and validate mycobacterial protein signatures present on small membrane vesicles released from M. tuberculosis-infected cells. These vesicles known as exosomes, are ideal for diagnostic development since they can be easily isolated from various body fluids including blood and urine. As pointed out by Schorey, “looking for mycobacterial proteins in serum of a TB patient is even harder then looking for a needle in a haystack; however, by first purifying the exosomes we greatly enrich for the mycobacterial proteins, allowing us to define which proteins correlate with active disease.” Once defined, antibody-based detection systems can be developed to identify active TB patients for antibiotic treatment. This project falls under the Gates Foundation’s GCGH program to fund Biomarkers of Health and Disease, which was developed to foster scientific and technological innovation to solve key health problems in the developing world. The goal is to identify specific disease biomarkers and to couple this with new technologies for miniaturization and detection. This could enable radically new ways to diagnose disease in individuals, even in remote or impoverished settings. “The recognition by the Bill and Melinda Gates Foundation that diagnostics is a very important component of disease management deserves applause. The implementation of a rapid diagnostic test at the point-of-care for diseases such as TB will have a significant impact on disease prevalence and mortality, particularly in low- and middle-income countries, ” adds Schorey.